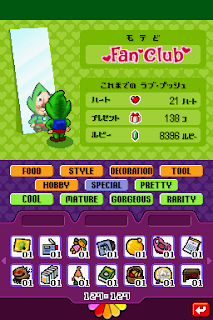 A project dedicated to getting Tingle's one and only point and click adventure game on the NDS translated. This is a blog that we use to post news on our translation of "Ripened Tingle's Balloon Trip of Love". 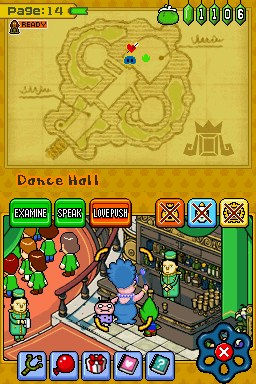 For those who don't know, it is a sequel to Freshly-Picked Tingle's Rosy Rupeeland. 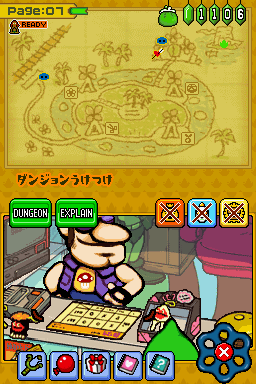 Rupeeland was released in English, but Balloon Trip of Love wasn't. This is an unofficial fan project. We are in no way affiliated with Nintendo or Vanpool, and are doing this completely for free. Happy new year to all of you Tingle fans out there! 2018 has been a crazy ride for many individuals and the world as a whole, but the constant guardian-angel-like presence of Tingle has enveloped us all in its protection. It’s been a year since the release of our English fan translation of Ripening Tingle’s Balloon Trip of Love, and we’ve had a lot of response and lovely interaction with the green dude’s fans as a result. On this occasion, I’d like to take a minute to point out some of the cool stuff that went on lately. Right after the release of the translation patch 1.0 on December 31st 2017, dozens of fans picked up the game, played it and left many nice comments right here on the blog. Our thanks go out to everyone who took the time to post something, and especially the ones who went above and beyond, finding typos and mistakes in the translation – leading to the release of a much improved patch version 1.1 soon after! 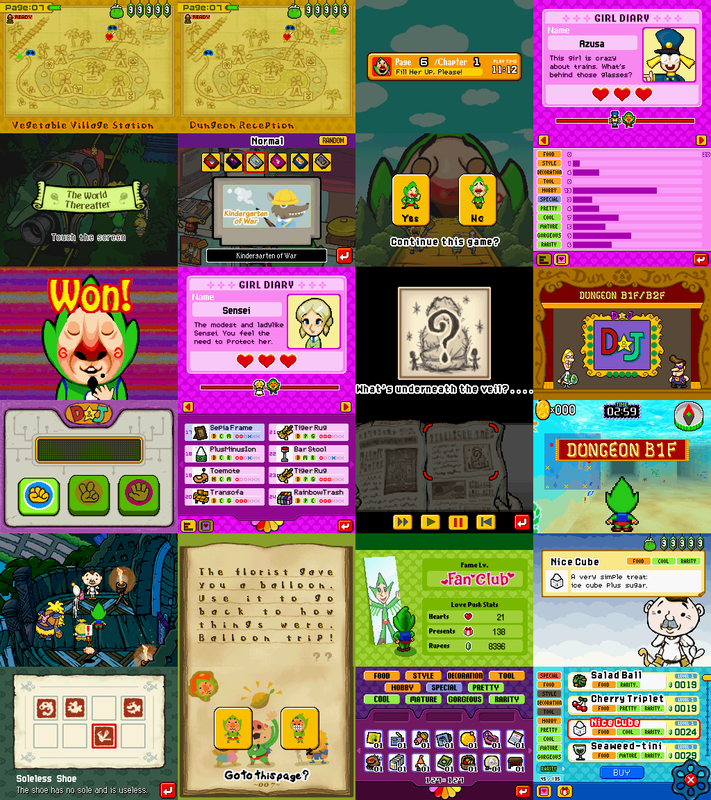 Probably the most fun thing to come out of Tingle’s new adventure are the many let’s plays people started to create immediately after the translation was released. Here’s a short list of those that I personally enjoyed. Vinesauce’s Vinny plays Ripened Tingle’s Balloon Trip of Love – If you watch only one Tingle playthrough, make it this one. He does the voices. SpaceHamster seems slightly confused by the events in the game, but delivers a very concise overview of the plot and mechanics of the game. Phase9Alex plays the game and pretty much live translates it into German language. Recommended viewing for the German speaking fans! That was just a short selection of the dozens of let’s plays out there. If you feel like I’ve missed a noteworthy entry, drop me a line and I’ll add it to the list. The fan translation is mentioned on TLBT’s entry on tv tropes. What the huh? Apparently, at one point Vanpool was working on a horror game starring Tingle. It was cancelled „due to a variety of reasons“. Hope you enjoyed this short but sweet selection of Tingle nuggets. If you’ve got more to add, just let us know, and maybe we’ll do a follow-up article featuring all the cool stuff we’ve missed. Don’t be strangers, leave your comments, and most importantly, have an awesome 2019! As promised, v1.1 of the translation patch is now available! Besides the issues I've outlined here, a slight aesthetic issue with the font has also been fixed. Also, as I said yesterday, the patch is now only compatible with the 100% correctly dumped ROM. If your ROM is not a complete dump, there is a patch included that will fix it. See the readme for more details. It has recently come to our attention that there is a crash that occurs at the end of Page 12 chapter 2 in version 1.0 of the patch. We've fixed this and should have an updated patch out tomorrow. Don't worry, your save file from the 1.0 patch will be perfectly compatible with the updated patch (as well as all future updates). We've also been notified of another problem with the current patch, which was touched on briefly yesterday. The 1.0 patch was based on a technically incomplete dump of the game. The missing data only totals around 100 bytes, and it has no impact on the ROM's playability. Still, it's better to have support for the correctly dumped rom, so this will also be rectified in tomorrow's release. Note that if you've acquired your ROM from somewhere other than your own legitimate cartridge, there is a high possibility that the dump is incomplete; the most common scene release (has (Independent) in the file name) seems to be an incomplete dump. This also means that if the 1.0 patch did work for you, your ROM is likely an incomplete dump, and as such it won't be compatible with the new patch. Once again we'd like to give a special thanks to CheatFreak47 over on GBAtemp for pointing that out to us. We hope everyone is enjoying the patch. It has come to our attention that some users are having trouble with the patch. This appears to stem from ROMs being slightly different depending on the method used to dump them. If you have been unable to get the patch to work, head over to the Releases section and try out the new patch there. Thanks go to CheatFreak47 for the fix! Well, I was planning on writing a long post thanking everyone and reminiscing about the last 5 years that I worked on this project. Long story short: bad stuff happened during testing, and I've been busy fixing it over the last few days. You guys probably just want to get to the good part anyways, right? So without further ado, we're proud to announce the first release of the Ripened Tingle's Balloon Trip of Love English translation patch! Well, what are you waiting for? Head over to the brand new Releases section and grab the patch for yourself! We've been working hard over the last month to put the finishing touches on the translation patch. At the moment, both the script and graphics are 100% translated. We're currently conducting a final beta test within the team before the first release of the patch. As we begin to wrap up the project, I'd just like to thank everyone who's been involved with the project over the last 5 years, especially the main team. Without them, there's no way that this would've ever been completed. This includes waldrumpus, DaVince, chir-miru, masterofzoroark, Rimbamboo, and zell0s. I'll write a more detailed post very soon to thank everyone that was involved, because this really was a team effort. I can't give a concrete release date, but it will be within the next few days. The exact day will depend on how many bugs/errors we find as we test the game. It's been a long time, but I can finally say with confidence that the first patch is almost here! We've determined that the script is of an acceptable quality at this point. We're currently finishing up the last of the graphics, after which some of the team members (including myself) will be doing a play through of the translated game to fix any glitches/typos/crashes or anything else wrong with the patch. I'm not going to say a specific date, but don't worry it will be very soon! I'll leave you with these screenshots - we hope everyone's excited! We have some exciting news! Our friend Bryan over at thegaygamer.com conducted an interview with me a little over a month ago. If you haven't seen it already, check it out here! In other news, we've also had a bit of help in the form of a new program to help out with the graphics, thanks to IcySon55 from Fan Translation Inc (FTI). He's the creator of Kuriimu, an amazing program suite made specifically for fan translations. You can read more about it on their GBAtemp thread. ... but rest assured we're still here! As always, I apologize for these long periods of inactivity on the blog. There just hasn't been anything newsworthy to post about :D.
We've officially begun the "editing" phase of the script. The script is very close to being completely translated, but it needs some touching up before a public release. waldrumpus worked hard for 3 years on that script (an incredibly impressive feat, considering the length and complete lack of any organization in the script! ), but as you can guess, keeping everything consistent over that long period of time would be impossible. I'd also like to give a special thanks to everyone who volunteered as an editor so far! I think we have amassed a great team that will hopefully make this translation the best it can be. Lastly, you can look forward to our friend Bryan Ochalla's has done an interview with the team about the translation project. You can find that interview on his website, thegaygamer.com, in the near future! Well it's been a while since we last said anything, hasn't it? Before I say anything else, let me reassure you that the Tingle's Balloon Fight DS translation is still going to happen. I promise :) . There's some behind-the-scenes issues going on, but it is still 100% going to happen. Anyways, the title of this post is a perfect example of why we are now asking for editors! Typos happen, whether we like it or not. waldrumpus has done an excellent job translating almost the entire script by himself (shoutout to DaVince too :) ), but that's a lot of sentences to translate. That's where a potential editor would come in. Basically we need a person (or a team of people) to go through the 13,000+ lines in the script, checking for typos and grammar errors, as well as improving the script in general. We also need that person (or at least one of them if it ends up being a team) to be able to speak Japanese at an acceptable level (i.e. 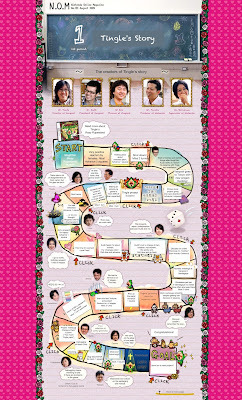 be able to play this game and completely understand it). Obviously the same thing applies for English. If you think you'd be interested in this, send me an email (click on my profile and click the send email link) and I'll get back to you with more details. 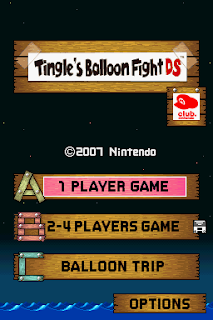 I thought I'd give a quick update on the Tingle's Balloon Fight DS patch. It's been two weeks since I promised to release it, but it's still not ready yet unfortunately. There is still a problem with the graphics that you'll notice in the video below. I have discovered a way to fix it, but it will take some time. Unfortunately it involves staring at numbers in a hex editor for hours which is not an easy thing to do :D . I've been trying to work on it a little each day, but only for a limited time. Balloon Trip of Love is our number one priority so I'm careful not to focus too much on Balloon Fight. As you can see, the text turns back into Japanese for some of the graphics. Like I said before though, I should have it fixed soon. Also for those of you with OCD as bad as mine - I know that "New Game" and "Load Game" aren't lined up properly. They use repeated tiles in their graphics (The "AME" part is actually the same graphic in the rom for both) so it'll require a little work on my part to fix them. The next time I post the patch will be released (barring any last-minute problems :D). 2017 - The Year of TINGLE! As you might know, 2017 won't be just another year around here. This year is the year that the first complete patch will be released! The script is getting closer and closer to completion due to the hard work of waldrumpus, and the graphics are also moving along smoothly with me, zell0s, and chir-miru. Hopefully you guys are excited, because I sure am. This translation patch has been, quite literally, years in the making. Soon Tingle fans everywhere will be able to play this awesome game! Of course it will still be a little while, so don't jump on the hype train just yet! We also saw a nice surprise over in the 3DS hacking scene that's relevant to us here. A NDS rom loader is being developed for the 3DS, which will allow you to run DS roms (and our translation patch) with only a 3DS or 2DS, no flashcart needed! You can read more about it here on GBAtemp if you're interested. I can't guarantee that Tingle's Balloon Trip of Love will end up being compatible with it, but it looks like there going for pretty much universal compatibility for DS roms. Many people have requested this, and I also alluded to it in one of my last posts. Yeah that is (or was supposed to be 😞 ) the Christmas surprise, a translation patch for Tingle's Balloon Fight DS! Unfortunately some last minute issues sprang up on me with the graphics shortly before Christmas. I tried to get it done before New Years but that didn't happen either. It should be done very soon, and in the meantime I have added a new section to the blog for it here. The first release will only include the 1 Player mode and the Balloon Trip mode, but if enough interest is expressed I will also do the 2 Player DS Download Play mode. Well it's been a while since the last update, but rest assured we're still here and have been working diligently over the last month on the translation! I wanted to do this small update just to give you guys an idea of how the graphics part of the project is going. We basically have two more categories of graphics left - the chapter scrolls and the "Secret Notebook" badges. Me and waldrumpus are working on localizing some of the badges before they're edited into English since some of them contain some vague Japanese pop references that need to be understandable in English. And for the chapter scrolls I just need to get moving with extracting them so Zell0s can edit them :) Other than that there's a few miscellaneous graphics that still aren't translated, and that's about it. We also have a nice surprise Christmas present coming in the next few days! I won't spoil what it is but we hope you guys enjoy it when it comes out. Due to some requests about them, I'd like to change pace a little and talk about two of the lesser known games in the Tingle spinoff series - the Too Much Tingle Pack and Tingle's Balloon Fight DS. It's something that's been asked about quite a few times, in fact a couple of people have asked on this blog. 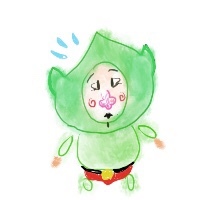 Are we also going to translate the Dekisugi Tingle Pack, better known in English as the Too Much Tingle Pack? A brief history lesson here for those who haven't heard about this game. These games were usually very small and weren't usually as deep (or expensive) as retail games. 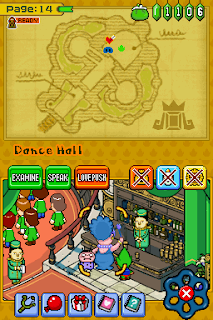 Shortly before Tingle's Balloon Trip of Love was released, Nintendo and Vanpool released a small DSiWare on the Japanese DSi Shop called the Too Much Tingle Pack. This was meant to promote Balloon Trip of Love, and as such it wasn't a full game. If you're interested in learning more about the actual game, you can read this page. Now, since this is such a small game, it would make perfect sense for us to translate and release it along with Balloon Trip of Love, right? I kind of agree; aside from one minigame that is very text heavy, the rest of the Pack is light on text. 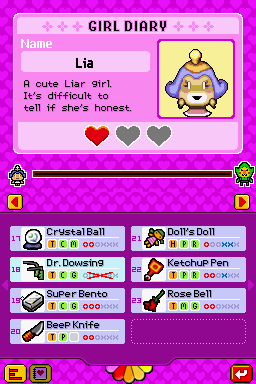 It also uses the same graphical engine as Balloon Trip of Love, so I would have no problems with the graphics. Well the answer lies in the way the ROM is coded itself. TWL games (games built for the DSi such as DSiWare and DSi Enhanced games) employ a special system within them that consists of "digest sector hashtables". That may sound like a mouthful of technical garble, but essentially they serve one purpose - to prevent any editing to the file system of the ROM. If even one byte is changed, the game will refuse to boot. Obviously this is a problem for a fan translation. The only way to resolve this would be to patch these sector table checks out of the ROM - something that I have tried and failed several times to do. 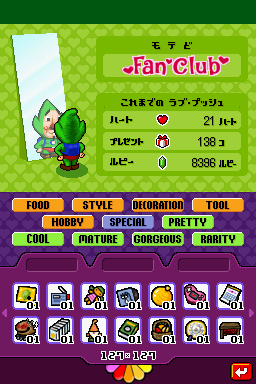 Until (and if) this problem is resolved, a fan translation for the Too Much Tingle Pack is impossible. *Oh yeah, I almost forgot. That title logo mockup was done by FShadow a while ago. Thanks to him for that! In lieu of actual content, here's a glimpse of what it's like1 to try and translate a couple of title cards and create an English version that fits into a fixed size grid yet still bears some resemblance to the original text. Hello everbody, today we have something a little different. Instead of writing about the translation project directly, we'll look at something from Tingle's Love Balloon Trip's publishing history. A couple of days ago, joesteve pointed me to a website with a couple of interviews and other articles by and about Vanpool, the company that made the game. It's styled in a "classroom" theme and I thought it was really neat. 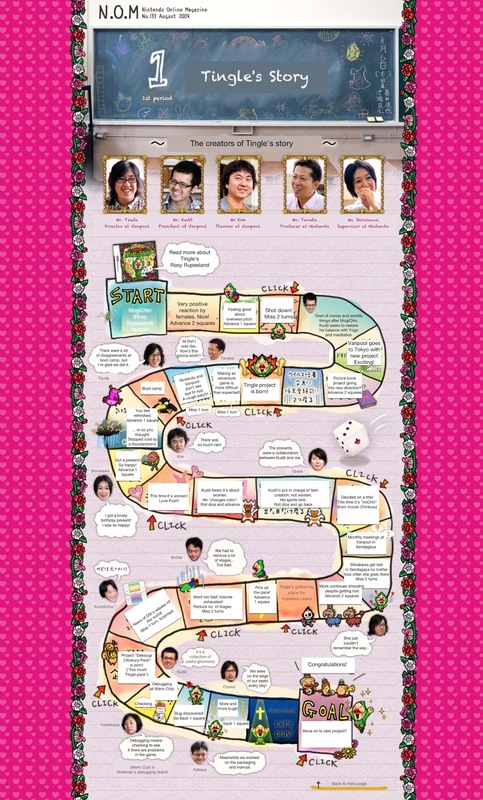 Especially the first page, which is done in the style of a board game of sorts and reveals details about the events at Vanpool between the release of Tingle's Rosy Rupeeland and Tingle's Love Balloon Trip. I liked it so much that I made a rough translation that I'd like to present without further ado. Update: View the image in full resolution! Alright, even though it's only two, they represent something much bigger - the green verb boxes are done! Yep, the nearly 50 boxes, which is pretty much the largest category of graphics in the game, is finished thanks to the work of zell0s! It's been 4 years already?! Yep, that's right! It's been four years since the Tingle's Balloon Trip translation project began! I'd like to take a little time to put things in perspective and explain what happened over those 4 years, and then I'll deliver that progress update that I promised in my last post. I started working on this on July 31st, 2012. At that time it was all about laying the technical groundwork for the translation. 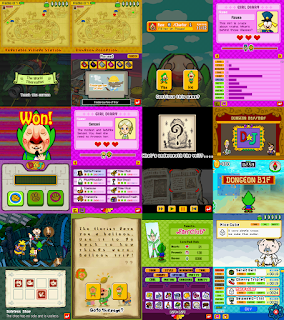 Around January 2013, yellow (known as ytdash here) joined me and we made a lot of progress with the graphics and text. This went on for about a year, with no actual translation being done, save for the intro and title screen. However, due to severe technical limitations, the text had to be condensed and the title couldn't be inserted into the game. (Some may recall this from the video posted a few years ago by ytdash). This changed in February 2014, when DarthNemesis, a member of GBAtemp, coded us a text editor for the game. This program made editing the text as simple as editing a .txt file. Shortly after DaVince joined and translated the first page of the game. Progress was slow over the next few months, as both me and DaVince were busy frequently and couldn't work on the translation as often. This changed later that year in August, when waldrumpus joined. 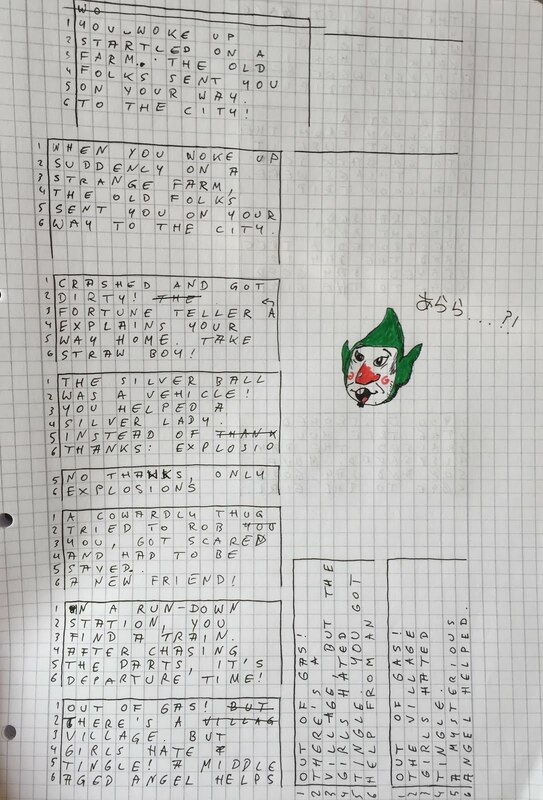 Having written a walkthrough for the game before, waldrumpus was very familiar with the game and quickly began to make progress in the script. Throughout 2015, I was able to figure out the games graphics system, and could now edit ingame graphics. So, me and ytdash began to work on translating the graphical text in the game. Finally, in July 2016, zell0s joined us as a graphics editor, helping to speed up the progress on that side even more. So that's it, it's certainly been a while. But how much longer will it be? I'm happy to announce that the patch is projected to be released within the next year! The script is nearing completion, and the graphics should be done in the next few months. Then there's just proofreading and beta testing, (which may or may not be public, we haven't decided). So now we get into more specific stuff - text editing! This is arguably the most important part of any translation (most at least), since the majority of the text is usually displayed with a script engine. As I mentioned before, the script for the game is located in data/db/lang.bin. In a very broad sense, this file is divided into two parts - line lengths/pointers and the actual text. The actual text is very simple to edit. 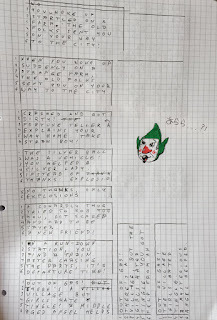 The game uses a 16 bit (2 byte) character encoding. That means that in a hex editor, two bytes equal a character rather than one. The more complex part of this comes with the other part of the file, the line lengths. Basically every line in the game has its length defined by a value in the beginning of lang.bin. Now this presents an interesting question that I don't fully have an answer to. The game doesn't use any kind of pointer system for the text, it just has the values that specify the length of each line in the same order the lines appear in lang.bin. So how does it know where each line starts, in order to display it ingame? I don't know, at least not for sure. However, the most logical assumption would be that the game somehow knows the order of the lines and bases it off of that (this is most likely in the olz files). This is further supported by the fact that the game only displays the text correctly when it's in the exact order as it was before being edited. So how do we edit the text? Sounds tedious right? Well, luckily we have a nice text extracter and inserter from DarthNemesis that exports the script to a .txt, and then imports the edited .txt back into lang.bin! As always, feel free to post any questions, comments, or concerns you may have! Original game copyright (C) Nintendo. Watermark theme. Powered by Blogger.